The Android Wear experience is all about slippery context cards, 'OK Google' voice control, and keeping apps out of the way. Let's review the basics in photos. I’ve been using Android Wear for just a few days now, but because Google’s new smartwatch OS is so simple and grokkable, I feel I’ve already drawn some reliable conclusions on its pros and cons. For this slideshow, my hardware model is the $200 Samsung Gear Live, but both this wearable and the $230 LG G Watch (see my video here) basically do the same thing. 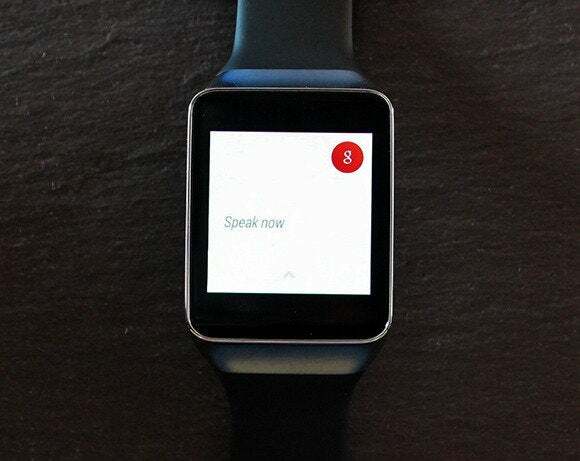 Android Wear is dedicated to pushing brief notification cards and Google Now alerts to your wrist, while also enabling voice control for text messaging, Google searches, and a host of other tricks. Walk with me as I show you important Android Wear features, and share what surprised me the most. Google says all Android Wear hardware will run the same OS experience, so expect an always-on watch face option to matter which model you buy. When your watch is idle, it will display a black-and-white version of your chosen watch face, along with a text-only snippet of your most recent notification. You can exit this “dim” mode and see the watch face in full-color glory by tapping the screen, or by raising your hand, turning your wrist, and looking at the watch. Notice how this particular Samsung watch face (“Dark Analog”) turns into a more complex chronograph upon waking. 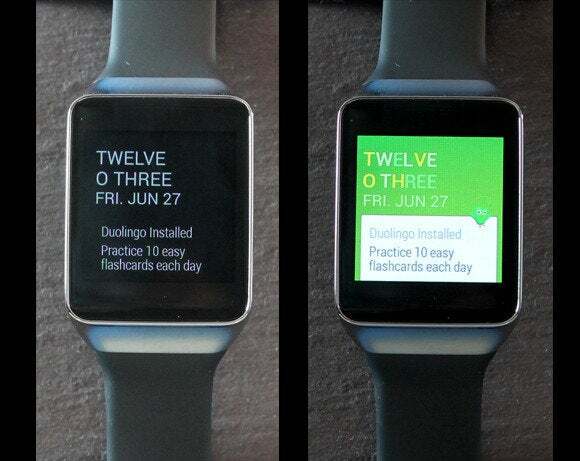 In the lead up to Android Wear’s public unveiling at Google I/O, I was under the impression that the OS featured a constantly changing home screen, with Wear’s “context stream” pushing new notification cards through the display like a quick-changing carousel. Well, I was wrong. The home screen is essentially static. The context snippets do change dynamically—when you receive a new notification. Notice how this watch face exposes more card information than the face in the last slide. Samsung offers 17 faces, and they all seem to vary in the depth of their notifications. Watch faces offer OEMs a small degree of customization (Samsung and LG offer different face options), and you can pick a new face with a long-press on your display. 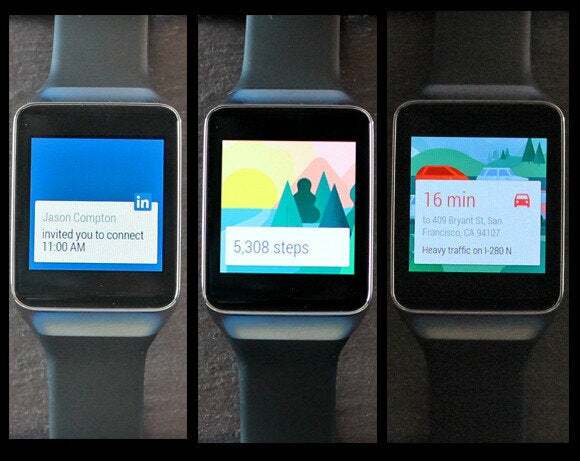 These images illustrate the progression of information that Android Wear surfaces. On the left we see a dimmed watch face—I have a CNN alert. In the middle, I’ve woken the watch for a more colorful presentation. On the right, I’ve swiped up on the screen to see the full notification. Notice that it’s just a brief snippet. Google’s intention is to limit the amount of text you see on a single card to make these screens as “glanceable” as possible. It’s a UI approach that’s mostly consistent throughout the OS, though if you run a voice search that spawns an information card, you might see a multi-line presentation with three screens worth of scrolling. Once you’ve chosen to look at a card, you can continue to swipe upward to see all the alerts and Google Now notifications that have piled up. Besides the cards shown here, I’ve also seen alerts for baseball scores, travel times, Twitter activity, a friend’s birthday (via Facebook), the weather, and an invitation to buy something from Fancy (an early Wear app coded just for the smartwatch OS). Once you kill a card by swiping it to the right, it’s gone forever. Google engineering director David Singleton told me that user studies indicate there’s no outstanding reason to maintain a card history. He also said Android Wear won’t expose Google Now cards for information that doesn’t fit the context of a wrist wearable—for example “What to watch” TV recommendations. Any notification you receive on your phone will push to your watch. 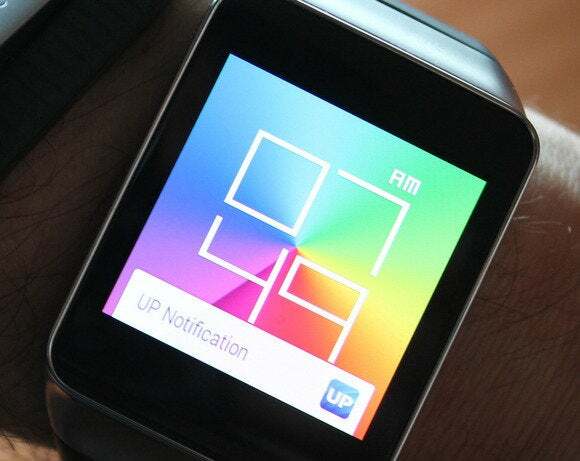 But unless the originating app has a custom Android Wear version too, your notification experience will be limited. Here we see an alert from the group-chat platform HipChat. I can see Melissa’s message, but when I slide the card to the left for options, I’m prompted to use HipChat on my phone. Clearly, HipChat needs an Android Wear app so I can chat with full voice control from my wrist. The good news is that when you turn on your handset after mashing the “Open on phone” button, your phone will shoot you straight to the app or information you requested. The lack of a custom Twitter app is frustrating, as I would love to compose tweets and @reply directly from my wrist. 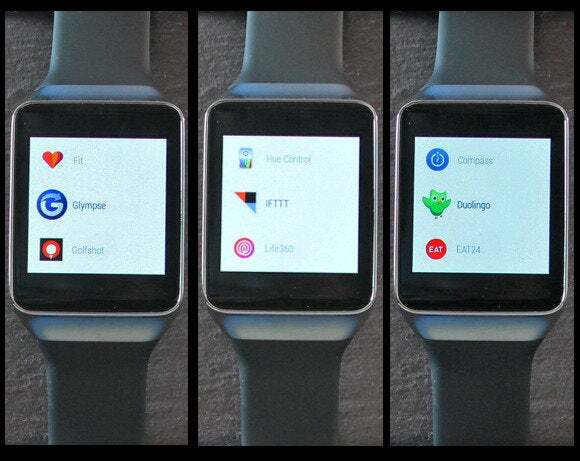 Still, Google lined up a number of partners to show off what bespoke Android Wear apps can do. The custom apps you see here are nested in the Start menu, which is buried in a list of “OK Google” commands. Sure, you could hit one of these icons to launch an app, but the preferred method is to summon an app with a voice command (e.g., “OK Google... launch Eat24”). The upshot: Android Wear runs apps, but completely ditches the traditional “home screen with a grid of app icons” construct. 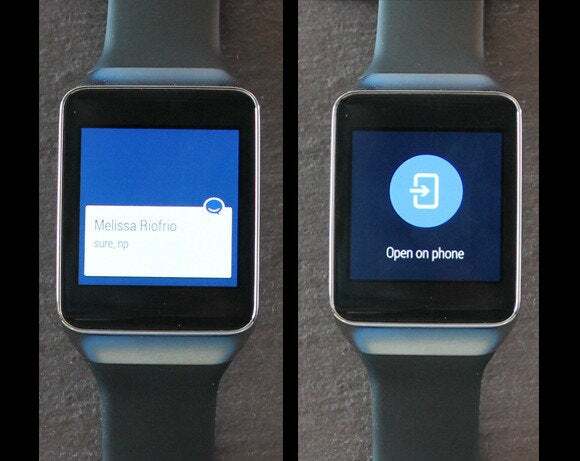 This is probably the most important interface element in all of Android Wear. 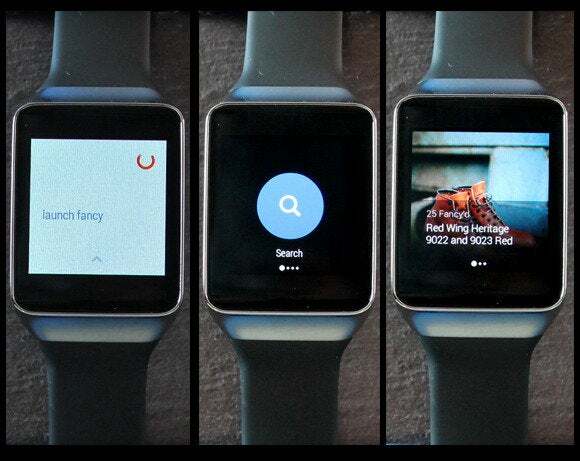 Simply utter “OK Google” into your watch to trigger a vast array of voice-controlled commands. For example, “Take a note” will let you dictate a quick memo that will be sent to your email address or Google Keep, if you have it installed. You can also “OK Google” basic Internet search queries (e.g., “What day is Labor Day”), and, best of all, send and reply to text messages with voice control. Just two early observations about where voice control breaks down: First, I found the feature unreliable in loud environments. Second, I felt like an OKGooglehole when uttering the phrase in public. Voice-controlled texting from your wrist can be a great convenience, and I found it usually works quite well, at least in relatively quiet environments. First you utter “OK Google... send a text to John Doe.” Assuming that person is in your Contacts list, you’ll be prompted to voice your message. From there, a new screen lets you check your message content, your recipient and his or her phone number. And of course you can voice-reply to any message you receive in return. But caution! All your messages will send automatically unless you cancel them by mashing the blue X button. The speech-recognition algorithms are surprisingly accurate. The most frustrating part is resolving duplicate or same-name entries in your phone’s Contacts list. Another voice command triggers turn-by-turn navigation. 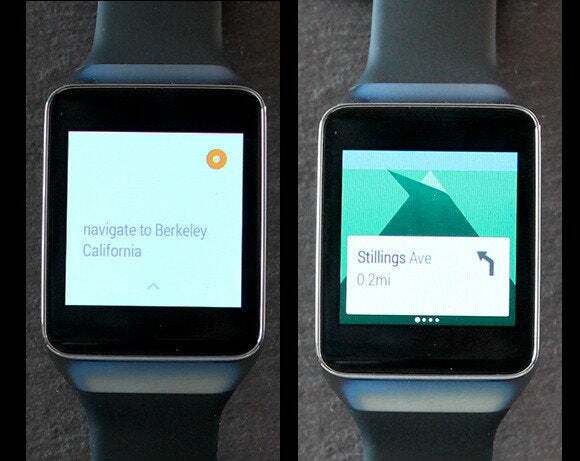 For example, from a location in San Francisco, I can say “OK Google... navigate to Berkeley California,” and Android Wear will show me turn commands. Wear’s navigation app also spawns the familiar Android navigation system on your phone, so you can also hear the turn-by-turn directions (it doesn’t look like any Wear watches will have speakers). It’s a convenient way to launch a navigation session when you’re driving. You can keep your hand on the steering wheel, while your phone remains cradled. Unfortunately, you can’t yet default the system to walking directions, and that’s a shame because Android Wear shows such great potential for exploring cities by foot. 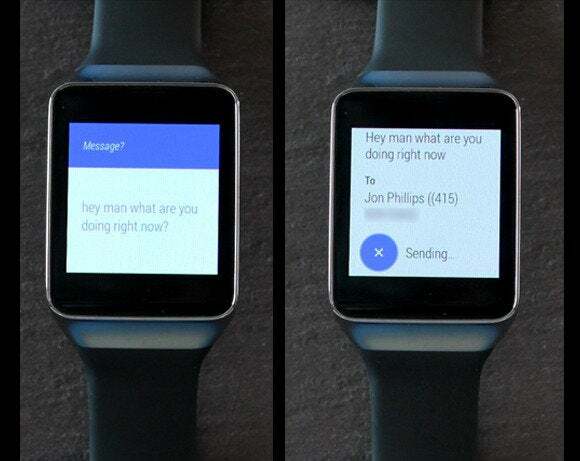 Android Wear is packed with a bunch of convenient voice-control actions. Directly from your watch, you can set an alarm for a specific time, and when that time rolls around, the watch will buzz, and you’ll see the interface on the right—from which you can either kill the alarm or hit snooze. There are also voice commands for setting reminders, timers, and a stopwatch function. The “Send a note” function is great, but I’d like an option to send notes to a note-taking app instead of to my own personal email address. 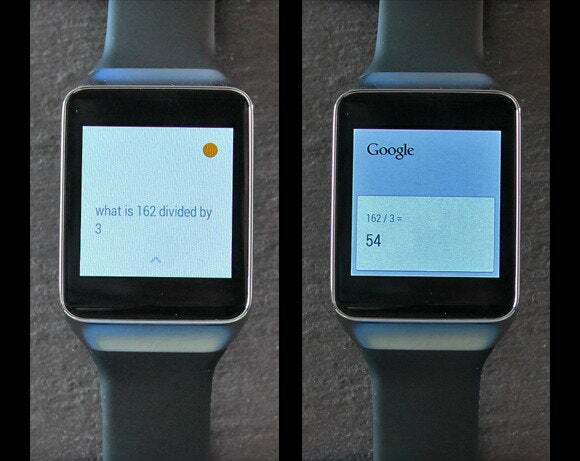 Another great Android Wear use case: Tapping into voice control for simple math problems. Need to split a bill three ways? You can, “OK Google... what is 162 divided by three.” You can also query, “What is 20 percent of 54,” but if you do so at a restaurant, everyone will know how much you tip. 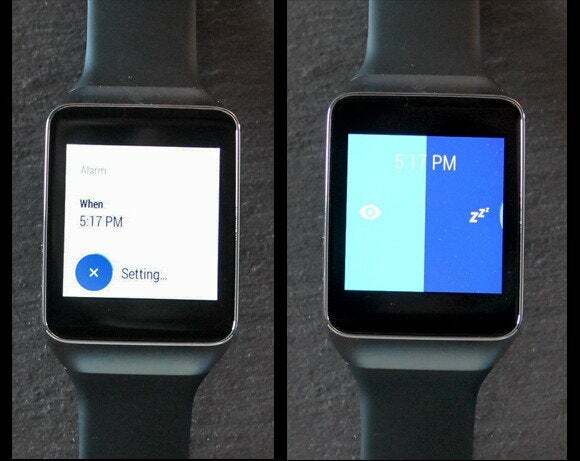 Here’s a look at Android Wear’s step counting app, which appears to look the same on both the Samsung and LG watches, per Google’s “no OEM skinning” initiative. 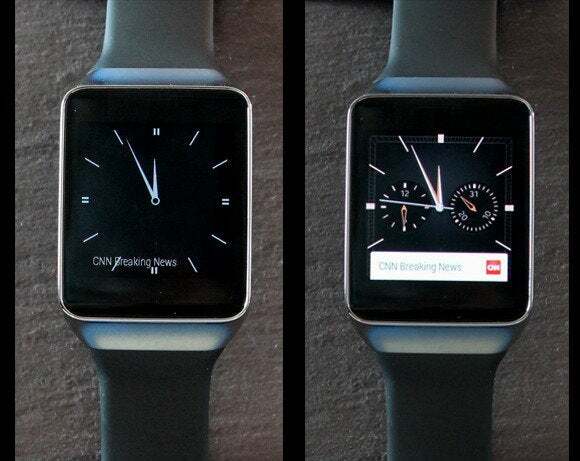 All Android Wear watches are packed with accelerometers, so step cards appear automatically in your context stream, as illustrated by the image on the left. You can also swipe to the left to see your step history: A timeline graph that shows your last seven days of activity. Samsung’s step interface also has a feature that lets you check you heart rate with the Gear Live’s built-in spectroscopic sensor. I’m not a fan of the Fancy app—“a place to discover, collect and buy amazing goods—because it assaulted me with notifications. 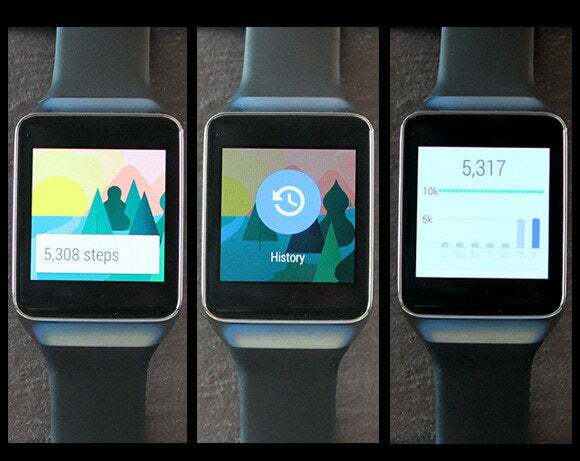 But it’s a good illustration of the Android Wear user interface experience. You launch it with an “OK Google... launch fancy.” From there, you see a very short list of simple, bold, pithy interface commands. There’s not much reading to do, per Android Wear’s design brief. Next tap Search, and voice your desired product: “Red Wing boots.” Up comes an appealing beauty shot of the boots, along with a brief snippet of text. 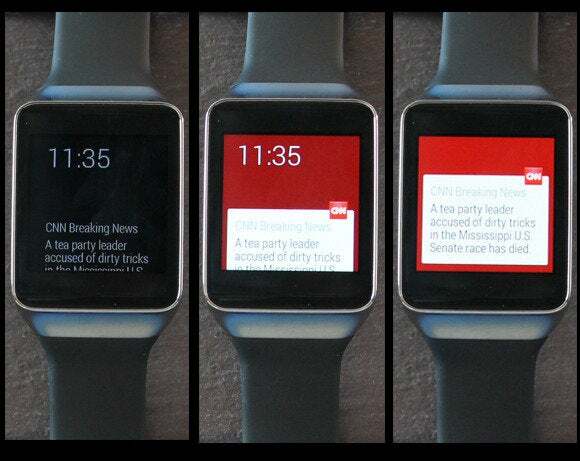 This is pretty much the Android Wear way: All the cards are big on visuals, and light on text. 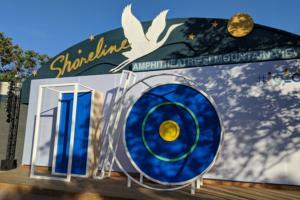 This is Google’s “glanceable” promise to users. I’ve spent enough time with Wear to know some likes and dislikes, but this slideshow is still just a collection of early impressions. Google is still working out bugs, and no official, third-party Android Wear apps have hit Google Play yet. That said, I’ve used Android Wear long enough to know it’s pointing smartwatch interface design in the right direction. We don’t need smartphone apps on 1.6-inch displays. We need the simple, easily digested information snippets that Wear provides. Add in Google Now’s contextual alerts and (usually) accurate voice control, and you have a platform that could make us forget the convoluted software design of earlier smartwatch efforts. 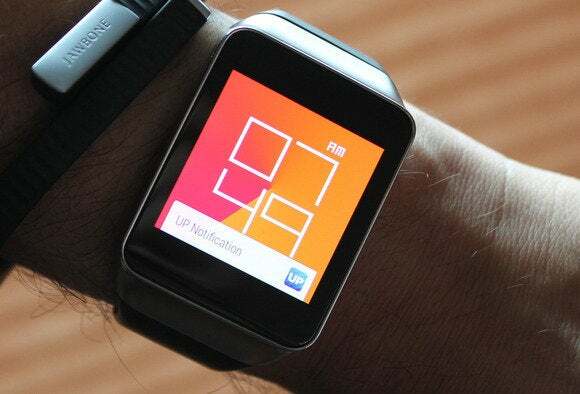 To that extent, the Gear Live is Samsung’s best smartwatch yet.